Her first novel, came with the caveat ‘not for the faint hearted’. If anything, the Secret is a more disturbing novel, particularly in view of its subject matter. Bridget Reid is missing, feared dead, and two young women are found murdered in the home that she was last seen in. Elias Papas owns Aphrodite nightclub where two young murder victims have recently visited. Is this a coincidence or were they both just in the wrong place at the wrong time? One of his employees, Dean Kinkade is the kind of villain that everyone loves to hate, or should that be hates to love? Are either of them implicated, or is it all far more complex than that? Miley and Grey have their work cut out trying to find the answers in this particular case. Detectives Adrian Miles (Miley) and Imogen Grey have a wonderfully realistic partnership and I can’t wait for the next novel – I feel sure that there must be one on its way as the ending of the Secret left me hanging – in a good way. 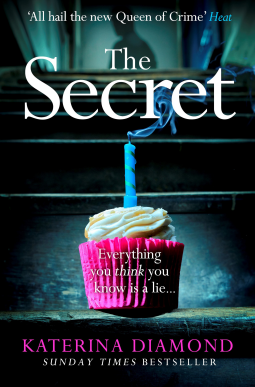 The Secret by Katerina Diamond is available to buy now via Amazon online and all good book shops.